Over the past month or so, I got a little bit obsessed with baking muffins. I'd make a batch, have a couple, and freeze the rest. Then, over the next few weeks, I'd take out one at a time and take them to work for a mid-morning snack. 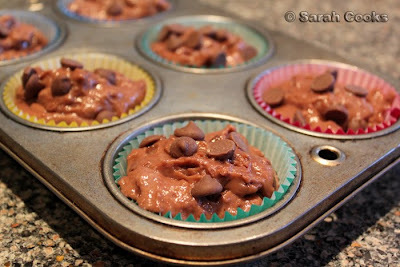 Muffins freeze fantastically, and a short burst in the microwave will bring them back to springy goodness. A fabulous little treat to get me through a tough morning at work. I much prefer homemade muffins to store bought ones, not least of all because store-bought muffins are usually way too big and filling. I've also found that even good cafes can make dodgy muffins. Case in point: Espresso 3121 in East Richmond (or is it Cremorne?) does wicked coffee, but the last time I bought a muffin from them it was cold, dense and dry. Even worse are the muffins which have the filling sprinkled on top and nothing inside. Disappointing! 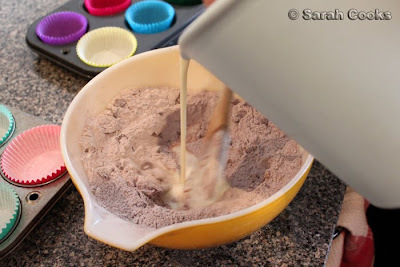 Almost all muffins follow the same pattern - pour wet ingredients into dry, and stir lightly to mix. 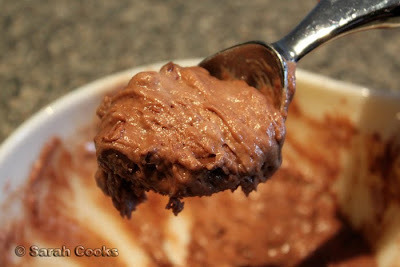 Then you add your add-ins (choc chips, fruit, whatever), and mix lightly. (A lumpy dough makes a light muffin.) If your muffin recipe does not follow this pattern, then what you've got, my friend, is a cupcake! I adapted the muffin recipe from Donna Hay's Modern Classics II, which uses sour cream as part of the liquid ingredients. I don't know if it was the greatest recipe, as the thick sour cream meant I had to beat the batter a bit more vigorously than I normally would for a muffin. I'd definitely stick to a recipe that uses milk or buttermilk. Apples! As you can see, we cut them up quite finely. 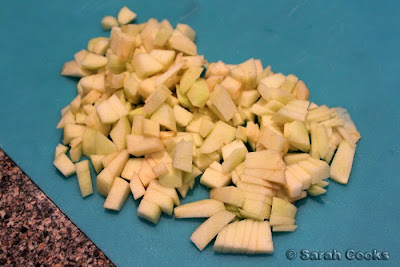 Next time I'd use more apples and use bigger chunks. The more filling the better, I say! TIP: Use an ice-cream scoop to get even-sized muffins. Nigella instructs you to sprinkle extra choc chips over the muffins, and who would I be to disagree with her? 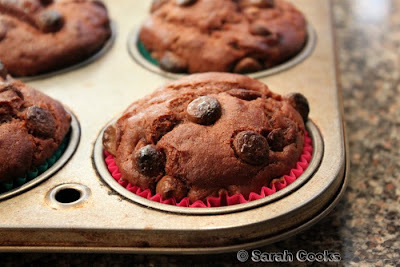 Normally I use chopped-up chocolate, but I think for these muffins, you really need the cute choc-chip shape. Mmmmm... I like how the choc chips on top get crunchy and caramelized. White chocolate and raspberry is an absolutely classic combination, and I'd struggle to think of a cafe that doesn't sell this flavour. (Incidentally, I also love Trampoline's raspberry and white choc ice-cream!) The advantage of making it at home is that you can use the best quality white chocolate, and pack as much in as you like! This time I did use a chopped-up bar of white chocolate. And I am totally obsessed with these Simpsons-designed glad bags. How cute are they? What are your favourite muffin flavours? Your best-ever muffin recipe? 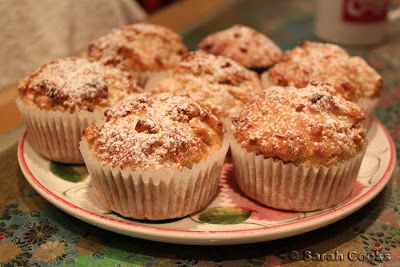 Does anyone know a great cafe or bakery that makes fabulous muffins? Great idea. I might just bake some and freeze it. Mister can have it for breakfast! They look great. 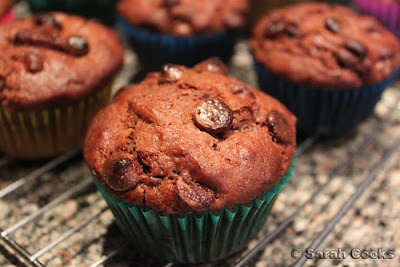 I also went through a big baking-muffins-to-take-to-work phase, but my muffins are always savoury (I can't handle sweet things in the morning for some reason!). My favourite recipe is basil, chilli and bacon, with a bit of tomato paste and garlic. Yum! I bought a apple cinnamon muffin this morning from the canteen and baked a mixture of chocolate muffin and berries muffin immediately after I got home. The muffins are still sitting on the kitchen bench!!! My plan was exactly same as you. 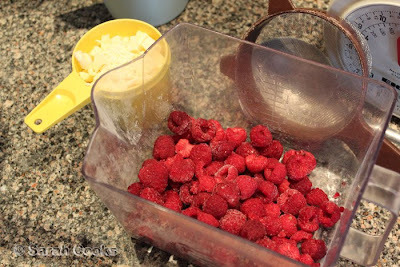 Have fresh tomorrow and pop the rest into the freezer! 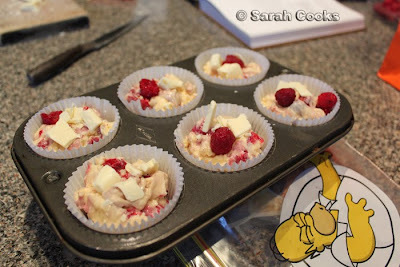 Ooh, I'd go with the white choc and raspberry, not snazzberry muffins. Sorry, had to say a line from Willi Wonka right there! 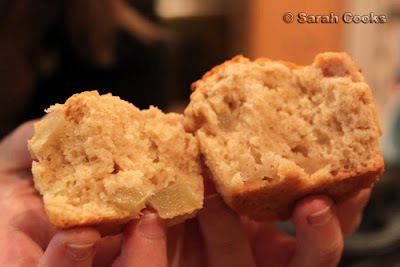 my sister has used nigella's pear ginger muffin recipe many times with much success, replacing pear & ginger with apple & cinammon. 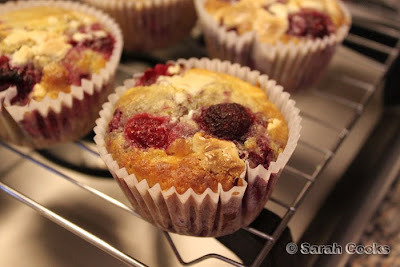 we also found using yoghurt rather than sour cream makes a better muffin. tytty - I def think yoghurt would work better than sour cream, thank-you for sharing! 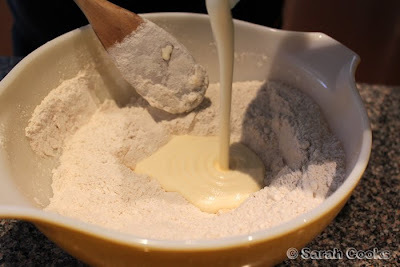 reading this post reminds me that i'm long overdue for baking a batch of my own!